Upright: Energy, passion, inspired action, adventure, impulsiveness. Reversed: Passion project, haste, scattered energy, delays, frustration. The Knight of Wands sits on his horse in full armour, wearing a yellow robe decorated with salamanders (associated with the element of fire), and a helmet with fiery red plumes flowing behind him. He holds a sprouting wand in his right hand, which symbolises his energy and enthusiasm for his mission. His horse rises up on its hind legs, poised and ready for action. Like all the Wands Court Cards, the background is hot, dry and barren, with mountains soaring in the distance. While the Page of Wands marks the initial spark of a new idea, the Knight of Wands shows the actual pursuit of that idea. When this card appears in a Tarot reading, you are charged up with energy, passion, motivation, and enthusiasm, and you channel that energy through your inspired action. You have a clear vision about what you want to create and, fuelled by your passion and inspiration, you are now moving forward with leaps and bounds to turn your vision into reality. This card is your sign to go for it! You are bold and courageous and willing to venture into unknown territories to further your mission and your dreams. You don’t really care if danger lies ahead – in fact, if it does, then it becomes all the more exciting and thrilling for you. Adventures like this light you up because you know growth and expansion are waiting on the other side. Be a pioneer and take calculated risks to reach new heights. In this light, the Knight of Wands gives you the feeling you can take on the world! You are so committed to your vision and purpose that you will stop at nothing to bring it to life. As you pursue your goals, your confidence skyrockets, and you realise that your potential is limitless. You can do anything! Your passion, enthusiasm, courage and confidence are highly attractive to others. Others see you as highly charismatic and want to be in your presence to benefit from your energy. While you haven’t yet mastered the art of bringing others along on your journey, like the King of Wands has, you do enjoy the extra attention that your charisma and adventures bring you. The question will be whether others can keep up with you, or if they are merely here to watch and absorb your energy by osmosis. Be mindful that the Knight of Wands can express himself as an ‘act first, think later’ type of person. In your pursuit of action, you may be impulsive and impatient, expecting everything to be done yesterday. While you are bursting with energy, you have a tendency to rush into things with little consideration for the consequences of your actions. You may not have a clear plan of attack, hurting your chances of long-term success. If this resonates, find a way to focus your enthusiasm on the activities that will move you closer to your goal. When you have a new idea, rather than acting on it straight away, take a moment to check in and see if it truly aligns with your goals and whether it needs to happen right now. You may realise that you are better served by waiting for the opportune time to pursue this idea, especially if other ‘waiting’ cards, such as the Hanged Man or Four of Swords, come up in your reading. Or, you may realise that the time is now, and you can charge ahead with high energy and vibrancy. 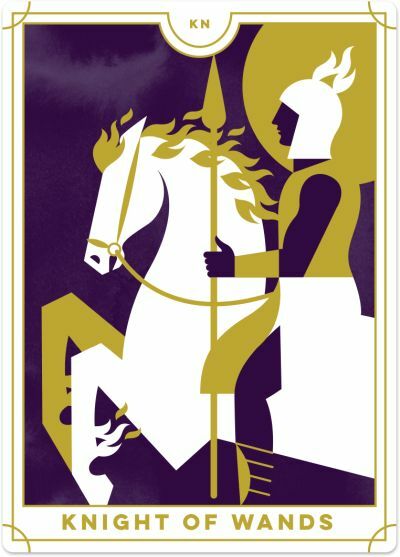 The Knight of Wands reversed may appear when you are actively pursuing a personal passion project or hobby. A fire has been lit within you, and now you are doing everything to move this passion project forward. You have no intention of turning it into a raging success – it is simply for you to enjoy and channel your energy into. For example, you may learn to read Tarot purely because you have an interest in this beautiful, spiritual tool, rather than wanting to become a world-renowned Tarot reader. You are pursuing this passion project with all of your heart because it genuinely lights you up inside. The Knight of Wands reversed can signal that you are experiencing a considerable build-up of energy but are unsure about how to channel it into the world effectively. You may have a creative restlessness, knowing that you are destined for something ‘big’, but you are restricted from taking action right now. Perhaps there are frustrating delays, insurmountable obstacles or people standing in your way. The tension from within is palpable, and you desperately need to release this creative energy. Look at alternative ways to pursue your passion or manifest your vision. You may need to adjust your path somewhat while staying true to your original idea. Conversely, the reversed Knight of Wands suggests that you may be acting impulsively, trying to accomplish everything at once. You are rushing from one task to the other, without focusing on the details or ensuring sustainable success. This may appear to work in the short-term, but long-term you could end up burning yourself out or falling short of your goals. Slow down and know that you don’t need to do everything at once. The Knight of Wands reversed also suggests that you are at risk of acting impulsively, doing or saying things that you may later regret. You want everything to be ‘fixed’ straight away, but you do not allow yourself the time to think through what is best for you. Be careful, too, that you are not reacting instantly to everything that happens. Give your circumstances some space and time before you take action. You may also find yourself feeling frustrated that factors beyond your control are impacting your situation. Again, remind yourself that there will be things that you can control and change as you want to – you just have to find them.